Skip any week. Cancel any time. Such an awesome idea! We were able to make date nights cooking together which never happens. I burn everything so was surprised when everything I made was delicious. We received our first delivery yesterday and my son and I had so much fun cooking together. It's a great solution to feeding a small busy household without waste and with delicious local fresh foods. For a health conscious, earth conscious, time crunched couple... this is perfect! Q. Can I skip deliveries? Yes, following receipt of your first delivery, you may elect to skip any week’s delivery for any reason and as often as you want. To skip an upcoming week you must do so before the weekly cutoff on Wednesdays at 11:59 PM EST. You may skip up to 8 weeks deliveries directly from your account. Q. What's in the box? 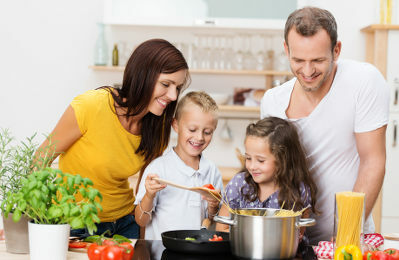 We include everything you need to cook 3 complete recipes to serve 2, 4, or 6 people. Our boxes include all the fresh ingredients you need in exactly the right proportions saving you prep time and reducing waste. You’ll also receive 3 beautiful recipe cards with step by step instructions for a delicious home cooked meal in about 30 minutes. Q. Do I need to be home to receive my box? Rest assured, our food is specially packaged with insulated liners and gel packs to keep it fresh and cool until you get home. Our delivery driver will generally leave your box at your door. You may include special delivery instructions in the notes section when placing your order or from your account. Q. Where do the ingredients come from? We only provide the highest quality ingredients to our customers. We source as much of our ingredients as possible from local Florida farmers with sustainable and organic practices. Check out our Suppliers Page for more details. We don't offer delivery in your area yet but we do have multiple pick-up locations available for your convenience! Free Box Coupon Applied Successfully! Please choose a plan from the options below to continue. A $65 discount will be automatically applied to your order.